We don’t expect our feline friends to have minty fresh breath at all times, but when things become particularly fragrant, it could be time to act. 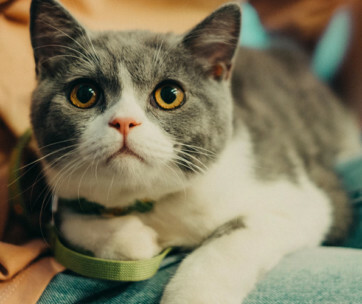 Bad breath in cats isn’t just unpleasant for their owners, it could be a sign of deeper health issues at play. 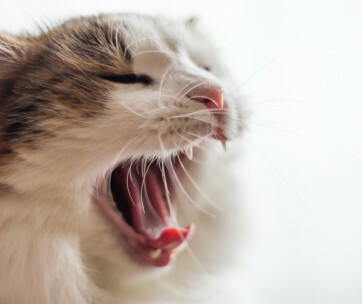 To help you understand why your kitty might have bad breath, what this could mean for their health, and what you can do about it, we’ve put together this handy guide. Below, we run through some important information about the symptoms, causes, and remedies of bad breath in cats. Often, bad breath is more of an inconvenience than a health issue. If your cat’s breath smells a little wiffy after they’ve consumed a strong smelling food, you shouldn’t have anything to worry about. Although dogs are better known for snacking where they shouldn’t, cats can do this too. If you notice the cat breath smells like rotten meat, it could be something your feline has eaten. 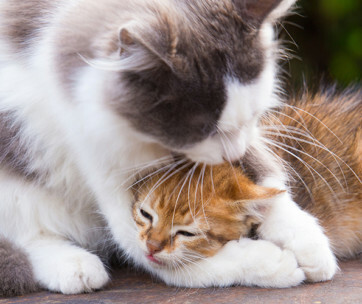 If your cat develops bad breath, it could be the result of multiple health conditions. Below we run through the most common causes, how to spot them, and how veterinarians usually tackle them. More commonly referred to as Gym Disease, this condition is the single biggest cause of bad breath in cats. Gum Disease occurs when dental plaque builds up around your cat’s teeth and gums, triggering an infection in the mouth. The bacteria which cause this infection produce that classic ‘bad breath’ smell. Feline Gum Disease is treated with professional teeth cleaning. This is usually performed at the vet’s office under general anaesthetic. 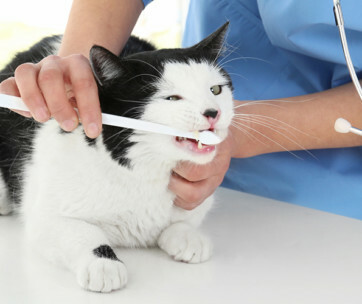 During cleaning, your vet will check for, and possibly remove, any diseased teeth. Feline Lymphocytic Plasmacytic Stomatitis is usually treated through a combination of teeth cleaning and antibiotics. Some diseased teeth may also need to be removed. 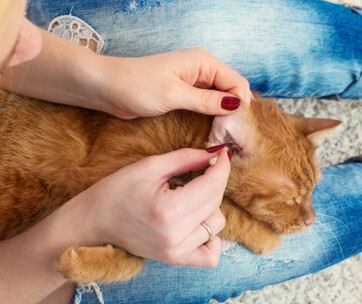 When possible, treatment involves surgically removing the tumor from your cat’s mouth, but this is not always possible. Other treatments include radiotherapy and chemotherapy. Unfortunately, the prognosis for oral cancer in cats is often poor. This is because symptoms don’t often emerge until the tumor is fairly large. In some cases, palliative care may be the best option for your cat. Kidney Disease is usually detected through blood tests. Although it can’t be cured entirely, it can be managed through diet, supplements, and sometimes drugs to address specific symptoms. Most Kidney Disease diets feature restricted protein, and low phosphate. With proper management, cats suffering from Kidney Disease can survive, with a good quality of life, for quite some time. Feline diabetes is usually detected by urine test. The condition can’t be cured outright, but it can be managed with a carefully regulated diet and insulin injections. Generally, middle aged and older cats are the most at risk of diabetes. Liver Disease is often triggered by excess fat, so overweight cats are at increased risk. It’s usually diagnosed through biopsy, urine analysis, blood work, and sometimes X-rays or ultrasound scans. Treatment depends upon the underlying cause of the disease, but is likely to involve dietary control and B-vitamins. Cats diagnosed with Liver Disease can often make a full recovery. Cats can be notorious for chewing and ingesting items that aren’t meant to be chewed or ingested. Sometimes, foreign objects such as rubber bands, or chunks of plastic can become stuck in your cat’s mouth. The object provides a great surface for plaque and bacteria to flourish, triggering very bad breath. Luckily, this common issue is easy to resolve. If your cat is used to having their teeth brushed, you may be able to remove the foreign object yourself with a good cleaning. If not, your vet may need to perform a deep clean. Sometimes, bad breath is just bad breath – caused by a smelly diet. Diets high in fish or liver tend to trigger this type of bad breath. This issue can usually be resolved by helping your cat to maintain good oral hygiene, and switching their diet. As we’ve seen, bad breath can be the result of a range of health issues, some of which can be prevented by maintaining good oral hygiene. 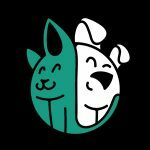 Many pet food companies produce what’s called a ‘dental diet’. These diets feature kibbles that have been specially designed to mechanically scrape away plaque and tartar. This prevents infections from developing, and keeps your cat’s breath fresh. This type of food also contains a selection of nutrients that further tackle plaque and tartar. For instance, sodium tripolyphosphate binds to calcium in the mouth, stopping it from forming tartar. You can also purchase dental chews with a similar effect. Purchase a toothbrush and toothpaste designed specifically for cats. Avoid using human toothpaste, since it contains chemicals that can damage your cat’s immune system. Build up gradually. At first, get your cat comfortable with you raising their lips to reveal the teeth. Next, introduce them to the toothbrush and toothpaste. Allow them to lick some paste from your finger, and allow them to interact with the toothbrush. When your cat is comfortable with the idea of fingers near their mouth, you can try brushing their teeth. At first, it may be a good idea to wrap your cat in a blanket or towel, to sooth them and prevent any scratching. Apply the toothpaste to the brush, and work the bristles gently along the hum line, angled slightly up. Use the opportunity to check for any problems, such as red, swollen gums, loose teeth, or tartar buildup. Reward your cat with praise and treats for having their teeth brushed, forging a positive association. 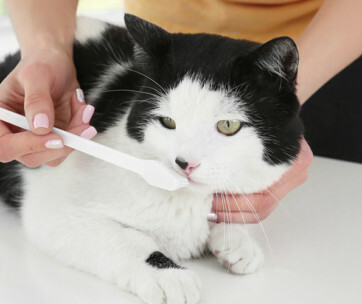 Brush your cat’s teeth as regularly as possible – ideally every week.